Offered is a 65-card mostly different array of multi-sports cards primarily from 1910 to the 1960s. 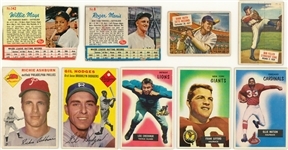 Highlighting this collection are Hall of Famers Ruth, Mays, McCovey, Spahn, Rizzuto, Feller, Mathews, Ford, Ashburn, Gifford, and many more. Includes: 1910 E90-3 American Caramel (1) - Schulte (presents EX, trimmed); 1910 T218 Hassan "Champion Prizefighters" (1) - T. Murphy (PR); 1913 T230 Pan Handle Scrap "World's Champion Athletes" (1) - Brundage (PR, pinholes); 1933 Goudey (2) - #'s 110 Goslin (presents EX, trimmed) and 164 L. Waner (GD, erased pencil); 1954 Topps (7) - #'s 17 Rizzuto (EX/MT), 20 Spahn (EX/MT), 30 Mathews (EX/MT), 32 Snider (EX), 37 Ford (EX/MT), 45 Ashburn (EX) and 102 Hodges (EX/MT); 1954 Topps "Scoop" (4) - #'s 27 Feller (GD), 41 Babe Ruth (PR), 65 Marciano (PR) and 130 Braves (FR); 1955 Bowman Football (18) - #'s 7 Gifford (NM), 8 Ameche (EX/MT), 11, 25 Matson (NM/MT), 29, 31, 32 Van Brocklin (EX/MT), 34, 36, 41, 42 Johnson (EX), 43 Fears (EX), 45, 54, 75 McElhenny (NM), 112 Creekmur (NM) and 132. 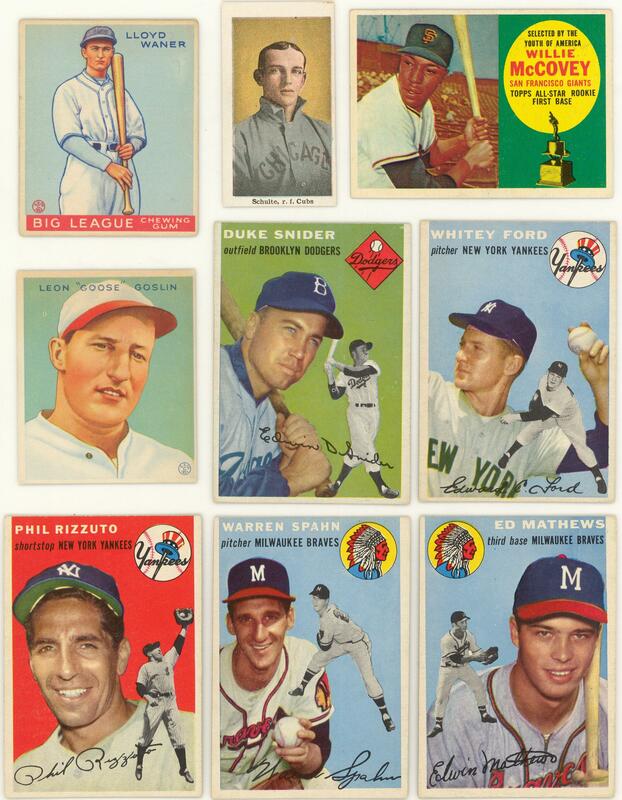 Grades 33% NM to NM/MT, 67% EX to EX/MT; 1955 Topps All-American (8) - #'s 14 Tinsley, 19, 35 Harmon (VG/EX), 50, 54 Dooley SP, 65 Donchess SP, 83 Coy SP and 88. Grades 50% EX to NM, 50% VG to VG/EX; 1956 Topps Football (6) - #'s 38, 39, 50 McElhenny, 84, 107 and 118 McHan SP. 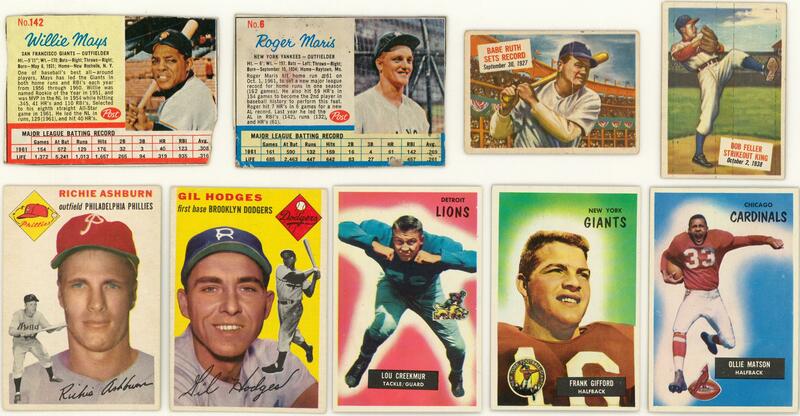 Grades EX to EX/MT; 1960 Topps (1) - #316 McCovey (EX); 1962 Post Cereal (2) - #'s 6 Maris (GD) and 142 Mays (PR); 1991 Topps East Coast National (14) - Aaron (4), Musial (5) and F. Robinson (5). Grades NM/MT to MINT.